In 1753 at the age of 22 Banneker completed a wooden clock that struck on the hour. George Ellicott lent Benjamin Banneker books and equipment to begin a more formal study of astronomy in 1788. Abolitionists and advocates of racial equality promoted and praised his works. He corresponded with Thomas Jefferson drafter of the United States Declaration of Independence on the topics of slavery and racial equality. 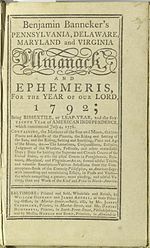 Benjamin Banneker (November 9 1731 – October 9 1806) was a free African American scientist surveyor almanac author and farmer.